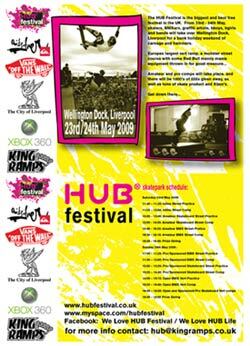 The HUB Festival takes place in Liverpool on 23rd & 24th May at Wellington Dock. This years skate area is being built by King Ramps and is hosting competitions in BMX, Skateboarding and Inline over the 2 days. Both sponsored and unsponsored riders and skaters are invited. Prizes from Vans, Quiksilver and XBOX as well as some decent cash. Both Vert and Street disciplines. The festival is free to attend and features a load of live acts as well as tons of other stuff like break dancing.